This week's episode of the podcast tackles two very different movies aimed at two very different audiences. But that's how we roll here at Daley Screening. We take all comers. Jon Stewart's Rosewater is an admirable freshman effort, depicting the story of Newsweek journalist Maziar Bahari who was imprisoned by Iranian authorities and held in solitary confinement for 118 days. Gael Garcia Bernal anchors the film with a lovely performance as Bahari. Bernal not only conveys the anguish of Bahari's psychological torment, but also finds remarkable moments of levity and solace. Stewart deserves credit for demonstrating the humanity of everyone involved, including Bahari's eponymous tormentor. It would be easy to portray Rosewater and his superiors as paranoid, mustache-twirling dolts, but instead the audience walks away realizing that, from their perspective, the Iranian authorities were simply responding to a reasonably credible threat in the only way they knew how. As Bahari tells Daily Show correspondent Jason Jones (who plays himself), America and Iran have more in common than most people realize or admit. The film perhaps overreaches in a few of Stewart's more stylistic choices, but in the end it's a minor quibble. It's a strong showing for Stewart's first film, even if it doesn't quite deserve some of the breathless adulation I heard coming out of Telluride. Disney's Big Hero 6, adapted from an obscure Marvel title, is an absolute joy for both children and the grownups who take them to the theater. We decided to go to a matinee screening with a friend and her kids (one of whom had never been to a movie theater before!) and everyone walked away smiling. The story is just a little slighter than I would have liked and there are a few key moments where the movie really spells things out for the younger audience in a way that's almost eye-rollingly obvious for adults. If you've seen a movie before, then you can basically see how the entire plot is going to play out after about 20 minutes, but I guess that's what separates Disney Animation from Pixar at this point. Pixar doesn't talk down to its audience, ever. 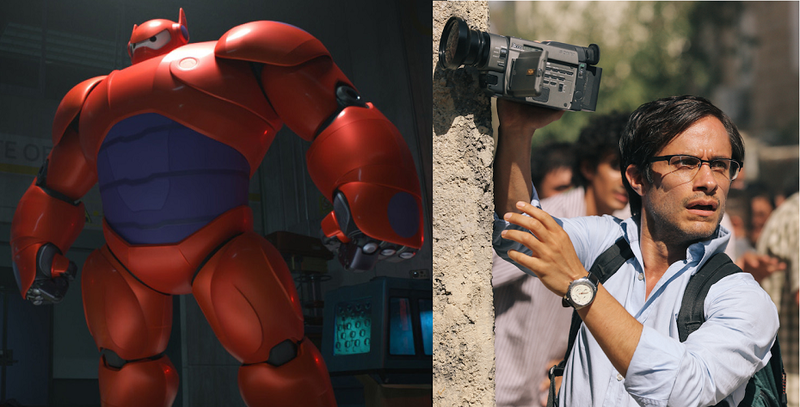 But even if Big Hero 6 is lean on story, it's BIG on characters. Baymax, the giant inflatable nurse robot, is equal parts sweet and hilarious. He also sets a new standard for fist bumps. But each of the supporting characters is totally awesome in their own distinct ways. There's someone here for everyone to love, whether it be girly-girl Honey Lemon, hard-nosed speed demon Go Go Tomago, fastidious Wasabi or the overly enthusiastic Fred, who was MY FAVORITE. Jenna and Jamie return to talk about all this plus casting developments for Suicide Squad, James Bond and Captain America, as well as Universal's misguided decision to reforge their classic monsters as modern day action adventures and the honest potential of the upcoming Rocky spinoff.